Mongols MC Wins Right to Wear Colors | Hupy and Abraham, S.C. 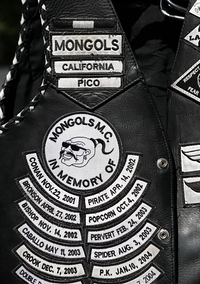 In October 2008, the federal government seized the Mongols MC trademark, in a highly publicized court proceeding. The government maintained that the club's colors were subject to seizure, and later forfeiture under the federal RICO statute. In fact, anything bearing the trademarked design of the Mongols was subject to seizure, including support items and even motorcycles. In May 2009, Ramon Rivera, a member of the Mongols MC, brought a civil case to the United States District Court, Central District of California. Mr. Rivera filed a motion for a preliminary injunction alleging that he could not wear his colors because the government would wrongfully seize them. The court found that Mr. Rivera had the standing to challenge the seizure order from the lower court, and that the government's seizure of property was improper. The court ruled that although the mark sought to be seized was not a typical trademark, it was a "collective membership mark," which directly implicated the First Amendment's protection of freedom of association. Click here to read the Court's Decision. The items sought to be seized were expressive and were associated with the Mongols Nation. Because of this association and support of the views of the Mongols, the government's seizure of property bearing the mark constituted an effort to silence those views, which amounted to discrimination and denial of First Amendment rights.